The ability to meet customer expectations is the most important reason for companies to undertake a digital transformation. Contact centers have been subject to constant change since their earliest days. As technologies and customer expectations continue to evolve, contact centers have had to adapt. With the ability to provide an omnichannel customer experience becoming an increasingly important competitive differentiator, those that are slow to change are not only hindering their ability to improve service levels, they are also losing valuable opportunities to increase efficiency and even generate new sources of revenue. The contact center evolution is perhaps most apparent within digital channels. In the past decade, we’ve gone from email being the only digital channel to there being web self-service, web chat, text messaging, social media, mobile apps, and more. Customers appreciate the speed and convenience of being able to obtain the help they need via a digital channel. Just how much do they favor digital customer service? According to Dimension Data research, digital interactions are expected to exceed phone contacts by the end of the year. There is growth in nearly every digital channel, while the number of voice interactions is steadily decreasing. Because digital channels continue to be added as technologies evolve, they are often patched into legacy, voice-centric contact center infrastructure. This leads to both departmental and channel silos that ultimately cause fractured customer interactions, as well as operational inefficiencies across the enterprise. For example, a customer commonly starts a journey on a website and then obtains more information using web chat. However, when they have a question or decide to make a purchase, they may shift over to voice. If digital channels are siloed, the agent who receives the call has no real-time or historical context to help the customer. This results in diminished service levels, decreased productivity, and lost cross-sell and upsell opportunities. The push for digital transformation has exposed the need to create an omnichannel experience that customers now expect and to bridge the contact center and customer service with the enterprise at large. Vodafone Germany, one of the country’s largest telecommunications providers, has always taken great pride in their customer experience. As the company began to add digital channels, they understood the importance of being able to serve their customers at every touchpoint. With more than 18 million monthly contacts handled by one department across multiple channels, they knew they needed a future-proof solution that would support omnichannel customer engagement across all digital and voice channels. This required a complete digital transformation. Want to Learn More About What Is Meant by a True Omnichannel Customer Experience? Watch this on-demand webinar – How to Deliver Omnichannel Customer Engagement, Today! 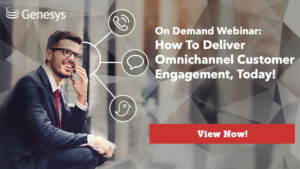 in which Barbara Gonzalez, the vice-president of Worldwide Business Consulting at Genesys, and I provide first-hand insight into what companies are doing today to innovate and deliver great omnichannel customer engagement experiences.